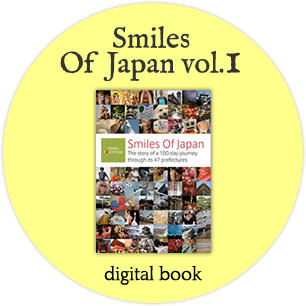 Our aim is to support the recovery of Tourism in Japan through a volunteer traveler’s objective impressions on a daily travel blog. Out of 1897 applications received from 85 countries, we select one to be our Travel Volunteer and visit Japan's 47 prefectures during a fully sponsored 100+1 days' trip. Find out how to support our project and follow this incredible journey starting 15th September 2011! The idea for this inspiring project came from an employee of a Travel Agency, called Magellan Resorts - The Real Japan in Kanazawa (Japan), while brainstorming how to bring Tourism back to Japan. After seeing the coverage about Japan from international media, we felt a big part of information was missing: although the eathquake, tsunami and nuclear issue are terrible disasters, Japan as a country was NOT entirely destroyed or irradiated. All other places outside the evacuation zone are totally safe. But the media never mentioned it or that life goes on normally in many parts of Japan. This had severe consequences for many businesses in the travel & tourism industry, so we decided to create this project to promote Japan amongst the world’s travellers and show that it still is a safe & wonderful country to visit. We were in Bolivia when it happened, the vastness of the Pacific Ocean and the impenetrable Andes between us and the Tohoku region. However, such is the way of the modern world, even in a $10-a-night hostel half a world away we could sit and watch the terrifying live coverage of the Great East Japan Earthquake of 2011 as through we were in Japan itself. The Tokyo offices shaking, the Tohoku fields being engulfed, the Fukushima explosion: these were the most striking news images we’d seen since those broadcast from New York exactly nine years and six months previously. Watching them, we felt just as helpless ? like everyone else around the world, all we could do was watch and listen. We didn’t like what we heard. Modern media feeds on drama and hysteria to function ? American news networks would be nothing without it. Manic speculation attracts viewers, who in turn attract advertises; the first to the exclusive makes the most money. In Bolivia, the only news networks we had access to were the international editions of CNN and Fox, the squabbling sisters of the American mainstream. Would things have been more sober on the BBC? We’d like to think so, but we honestly don’t know. Instead, there were ludicrous conversations with American anchormen talking to American experts in an American studio. There was virtually no word from Japan ? just those pictures, which seared into the world’s collective consciousness. Meanwhile, the on-air conversation was making its own headlines: “Is there a meltdown at Fukushima?” “I don’t know, but we can’t rule anything out.” As journalists, we found it sloppy and embarrassing. The Japanese government was perhaps too slow to release information, but the western media had precisely the opposite problem. Some days later, when we next sat in front of a television, pictures from Tohoku started to emerge. Like most people, we wanted to go to Japan to help; like most people we were bound by practicalities. As backpackers our budget was planned day-to-day in order that we could arrive back at home penniless but satisfied. Flights to Japan were simply out of the question. Instead, we spoke to friends who were living in Japan, read news reports and hoped for the best for the Japanese people. Four months later, we had navigated our way north through the Americas and were coming to the end of our trip. Just two days before we were to fly back to the UK, in a Washington DC motel room, we got an email. It was a collection of travel stories and opportunities for journalists ? top of the list was the Travel Volunteer Project. Here, finally, was our chance to help. In spite of having no money, this was an opportunity to get to Japan and to volunteer. It’s not like we had a jobs or a home to give up, either. Not only that, but it would use our specialized skills: Jamie as a writer, Katy as a photographer. Given how thoroughly useless we’d have been with a hammer or a saw, it was better for everyone that we use our training and expertise to help the devastated area. We submitted an application, said a small prayer to the traveling gods, and promptly forgot about the whole thing. So when, just three weeks later in Katy’s home in Britain, we found out we’d been short-listed to come out to Japan for the final selection process, we were genuinely stunned. With such a carrot on offer ? the chance to see every part of Japan, all expenses paid ? we thought the quality of applicants would mean we’d never hear anything more about it. Even flying out to Japan, we didn’t think there’d be a hope of actually getting the job. And when we did, it took several days for it to sink in. Not that we had time to think about it: the project was manic from the start, and before we had a chance to even overcome our jetlag we were on the road blogging about our experiences. Thankfully, we were welcomed to the country by hundreds of supporters and volunteers, without whom this project would simply not have been possible. Their generosity and spirit are some of the things we cherish most from our time in Japan, and the memories that make us most hopeful for the nation’s future. We’d said in the final interview that we’d approach the projects as professionals, and we like to think we achieved that. But it was difficult to remain joylessly professional when the country surprised us with so much, so often. Itinerary might be changed without prior notice. Jamie Lafferty stumbled out of university unsure of what he wanted to do other than play golf. A few months later, owing to a series of fortunate events, he found himself working in newspapers. He spent two years trying not to embarrass himself at the Sunday Herald, and was eventually asked to go on a press trip. Upon realising that it was possible to travel and write at the same time, he set about making this arrangement permanent and took a job in Dubai, writing for Etihad Airways' magazines. At this time he also met and quickly fell in love with Katy. Five weeks after getting together, they were sharing a flat and saving hard to escape the desert heat. A year after that they were on the road, backpacking around the world. Just when they thought it was time to go home, they found themselves in Japan. After graduating from University, Hiroshi Kuchiki first joined one of the largest travel agency in Japan, specializing in package holidays and discounted flight tickets. He then joined a wholesale travel agency specialized in Hawaii. Disappointed by his experiences with mass-market oriented companies but enthusiastic after discovering the personalized hospitality concept at three Amanresorts properties in Bali, he decided to establish an innovative travel company, focusing solely on tailor-made luxury vacations. Magellan Resorts was born. Magellan resorts is now a major business partners of Aman resort, Six Senses and many more. Based on the company’s results and reputation, Hiroshi Kuchiki was invited to the world’s most exclusive travel show such as ILTM and PURE, often being the first and only Japanese VIP buyer and built an extended his network worldwide.In 2006, Hiroshi Kuchiki again pioneered the Japanese travel industry by launching the first luxury Inbound Department, specialized in tailor-made journeys & experiences for discerning international travelers: The Real Japan. Born and raised in Kanazawa, Eriko Kaminashi loves her hometown for its great food, climate and nature. She mostly spends her free time in the middle of mountain for spiritual inspiration and minus ion for activating brain. Have a afro hair dog and love silver art at the moment. After graduating High-school in Japan, Eriko studied tourism in Denver, Colorado, USA. She first worked at a travel agency in Kanazawa for 3 years and decided to cross the equator to live in Cairns, Australia, where she spent10 years. Working for a cruising company called Great Adventures (presently part of Quick Silver connections) as sales & marketing assistant, she then jumped into a new field which also provides hospitality: Louis Vuitton Cairns store. Learned and touched by the strategies of being a top leading company in designers fashion brands, gave her many idea of what is luxury, the importance of clientele and searching new innovative productions. In 2010, Eriko returned to Japan for good and chose the great opportunity of joining The Real Japan - Magellan Resorts to continue working in tourism and keep in touch with the whole world. Katy Morrison rarely stays in one place for long. The last decade has seen her live and work in Canada, UK and the UAE. Her passion for travelling has taken her to 54 countries and six continents. After realising that work was getting in the way of her travel bug, she convinced Jamie to do a stint as a backpacker. From June 2010 to August 2011 they spent their time exploring China and South East Asia, Antarctica, the majority of countries in South and Central America, and finally the USA. Trained as a photographer and graphic designer, her pictures illustrated the Travel Volunteer Project, and have received praise from people around the world. Aya Kihara was born in Hyogo and moved to Tokyo before entering elementary school in Oita and finally studied at the University in Kyoto. Starting her career at “The Ritz-Carlton, Osaka” as an opening member with a first experience as restaurant staff followed by Club Concierge, she deeply learned The Ritz-Carlton hospitality before transferring to “The Ritz-Carlton, Dubai” as a Guest Relations. In 2004, she got a great opportunity to join “lebua Hotels & Resorts” in Thailand, developing her carrier in various positions and experiences until becoming the Hotel Manager of luxury hotel named “Tower Club at lebua” & “lebua at State Tower” in Bangkok. After 8 years overseas, Aya recently returned to her home country and based in Kanazawa, to enjoy new challenge with The Real Japan - inbound department of Magellan Resorts & Trust: managing a travel agency creating unique trips for people from all over the world. Her life goes with “challenge” & “discovery” to look for the ONE! Born and raised in Paris (France), Eric got the “travel bug” from his parents at a very early age. After studying International Business in France and Germany, he decided to travel extensively and spent 6 months in Asia and 8 months in Africa, discovering the countries and the local populations by many different transportations ways: plane, train, bus, car, slow & fast boats, on foot and even on tractors & camels. He then moved to Cambodia, working first as a volunteer to finally end up in the luxury properties of the Raffles Grand Hotel d’Angkor and Amanresorts’ Amansara. Eric moved to Japan a year ago and now lives with his Japanese wife and two children. As the Director of Sales for The Real Japan, he enjoys finding new destinations in Japan and sharing them with travel agents from all over the world. The Real Japan / magellan resorts & trust inc.